Pennau Craft & Coffee Shop01970 820050work Craft CentrePennau Craft and Coffee Shop in the village of Bow Street is just four miles north of the busy coastal resort of Aberystwyth. 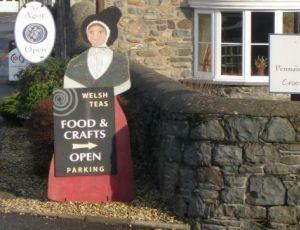 At Pennau Craft Coffee Shop, the accent is firmly on offering the best that Wales has to offer. Pennau Crafts boasts an impressive range of Welsh products which includes the eternal symbol of undying love, the Welsh lovespoon, slate engravings, Celtic jewellery, sheepskin products, clothing and all mannner of souvenirs. If it’s the best of Welsh produce you’re after, then take away preserves, confectionery some fine Penderyn Welsh whiskey or Welsh beer from the award-winning Penlon Brewery. But go easy on it! This impressive complex received a Living Landscape Award from the Campaign for the Protection of Rural Wales in recognition of the outstanding quality of workmanship that went into the restoration of the stone-built barn. The Craft Centre includes a section dedicated to Cross Stitching and enthusiasts will find everything they need to occupy themselves during a rainy a day. 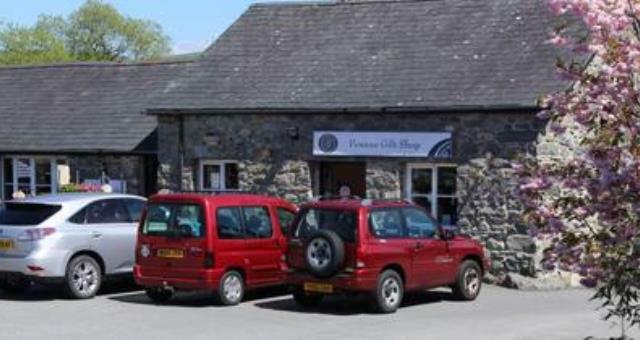 With ample car parking Pennau Craft & Coffe Shop is open throughout the year, offering an extensive menu of home-cooked food all day long - not just at lunchtime! The majority of the menu is prepared in Pennau's own kitchens and dishes all have one thing in common: they're all prepared with loving care using only the best available ingredients. The coffee shop serves great tasting Cappuccinos, Lattes, Americano's and espresso's all made with freshly ground Caffe Gioia coffee beans.Bow StreetNr AberystwythCeredigionSY24 5AAUnited Kingdom52.453791430400-4.018996123300http://www.craftshopwales.co.uk. The majority of the menu is prepared in Pennau's own kitchens and dishes all have one thing in common: they're all prepared with loving care using only the best available ingredients. The coffee shop serves great tasting Cappuccinos, Lattes, Americano's and espresso's all made with freshly ground Caffe Gioia coffee beans.